People where you live, the little prince said, grow five thousand roses in one garden... Yet they don't find what they're looking for... And yet what they're looking for could be found in a single rose... It is the time you have wasted for your rose that makes your rose so important. For years I was convinced I had read this story and did not like it one bit. As it turns out, the story I had been thinking of was The Happy Prince by Oscar Wilde, which I do find unpardonably boring. The moment I realized The Little Prince by Antoine de Saint-Exupéry is a novella, described by many as a children's fantasy that serves as an adult's spiritual fable, I wanted to pick it up. This was about a year ago. I read it today as the first book for my favourite not-challenge, Once Upon a Time, an annual event in its ninth year, hosted by Carl at Stainless Steel Droppings. 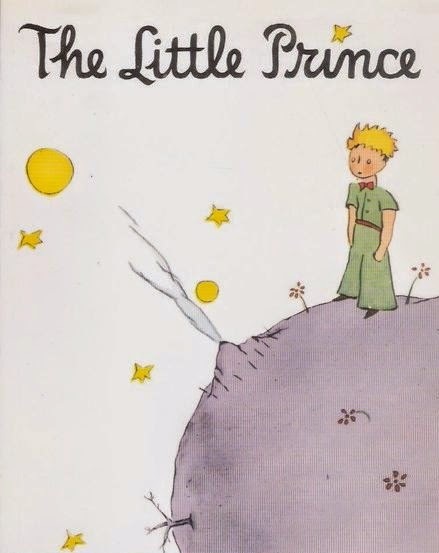 Summary: The Little Prince by Antoine de Saint-Exupéry is the story of a little boy who leaves the safety of his own tiny planet to travel the universe, learning the vagaries of adult behaviour through a series of extraordinary encounters. His personal odyssey culminates in a voyage to Earth where he meets our narrator, a pilot crash-landed in the middle of an endless dessert. My thoughts: The Goodreads reviews of this book all seem to have one word in common, "metaphor." I hate to be redundant and talk about what a wonderful allegory The Little Prince presents. Most of you have probably read this book and already know all about it. And every new reader of the book will eventually end up on the author's life story, to make sense of the allusions and connect the metaphorical autobiographical dots. I would recommend you this book mostly because almost everyone who reads it finds in it something to love. It is precious, and honestly, a chunk of its charm lies in its slim size. It demands little of your time, give it that. The thing that I truly like about this book is its sincere duality, of both intention and style. "One explanation may be the way in which they (children's books) are read. They become part of our emotional autobiographies, acquiring associations and memories, more like music than prose. Another explanation may lie in the fact that children’s books are designed with re-reading in mind. For all children’s writers are conscious that our books may be re-read by children themselves." I thought that reading The Little Prince would be like getting wholly engrossed in a Roald Dahl book at twenty or delightedly revisiting one of my childhood favourite Enid Blyton stories. It was nothing like that. It may be difficult to write children's books that would give pleasure to grown-ups too. Authors like Neil Gaiman are good at that sort of thing. The Little Prince on the other hand is something entirely else. It is not a simple children's book that adults would enjoy as well. What makes The Little Prince unique is that it contains in its pages two different stories at once - one for children and another for grown-ups. It reminds me of my experience reading Philip Pullman's His Dark Materials trilogy, a series of books so adult in its themes and messages, it made me wonder what I would have made of it as a kid. And yet, I am sure, had I read the series when I was twelve, I would have found lovely treasures in the books quite separate from the ones my adult-self found. I don't know what little-Priya would have made of The Little Prince. Young-me would likely have loved the illustrations, thrilled at the absurd planets, their whimsical inhabitants and the talking foxes, enjoyed the reaffirmation of the importance of being a child. Meanwhile, on the other side of time, today, catching my eye are little fractions of well-composed truth in the writing, like reaching success by "the inspiring force of urgent necessity." I shake my head at the many droll depictions of empty human life. I mull over coming-of-age, the loss of innocence and our place in the great big picture. I contemplate the futility of that exact train of thought... and with the very same logical disinterest the book mocks, find myself dissecting those pesky metaphors! The book never sounds overtly preachy, that helps. The narrator in his straightforward manner rarely expresses his opinions on the lessons the little prince teaches him. The book remains staunchly bizarre, surreal, to its very end. The original French must be beautifully written, I am guessing, from the admirably seamless translation by Katherine Woods. I should learn French. Out of curiosity, how exactly do you pronounce the author's name? Now that I have read him, it may be time to stop calling him MumbledeMumble-Mumble. I am happy to have finally read the book. That said, I will not read the book again. I doubt that there is any new insight to be gained from another read, which I must say, is not true of Philip Pullman and his complex constructions. I do however see myself revisiting nice passages, and forcing the book on all my future young-acquaintances, if only as guinea-pigs to satisfy my curiosity about how a child would react to the incongruously dark ending. Many people seem interested to know if horror writers believe in ghosts. Horror writers are known to skilfully evade such questions. I find the line of thought mostly irrelevant. I don't think one needs to believe in ghosts to write horror. Horror is not about ghosts. It may star ghosts, but so could romance (Have you not seen Ghost?) or any other genre. Horror is about people. 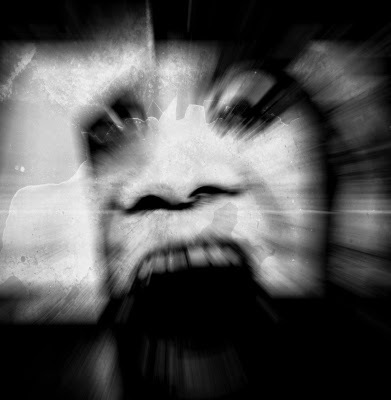 To write good horror, I think, it should suffice to believe in fear. Horror is so tricky to write. No good writer can write a convincing horror story if it doesn't scare them. And imagine that, getting scared of your own writing. (And I don't mean editing-nightmares.) A part of me wants to stop reading interviews and imagine a thirty-year-old Stephen King in a panic, shoving his typewriter (surely he has one?) into the fridge because The Overlook is turning steadily more sinister under his fingers. To create real fear, mustn't you need to feel fear? Not just channel it, but to give in to it and let it guide you? The term primal fear is interesting. On the face of it, the Lovecraftian (yes, there must have been others who said it) idea that it's the oldest human emotion seems indisputable. One of my favourite blogs, A History of Emotions, talks about how this may not necessarily be true. It sounds very logical, but I want to side with Lovecraft. Fear is all instinct, an emotion you seem to have little control over, so naturally, you'd want to ascribe it to your animal-roots. 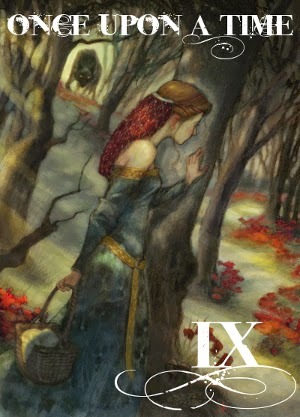 I don't write a lot of horror, I much prefer mythology and fantasy. But when I do, I write at night. I arm myself with the cheeriest Gilmore Girls episodes, coffee and when handy, a cat. Then I type, letting the fear and self-doubt build on till I'm at the brink of freaked-out-dom. And just when I'm about to give up and delete everything, I switch to a particularly adorable (like this) Jess-and-Luke scene, pet my cat, take a swig of creamy coffee. I calm myself down, decide I am doing well, take a deep breath and continue. It's torture, and fun. (Yes, I exaggerate, call it narrative license.) At night, it all ends up dramatically overwritten. In broad daylight, I edit. I try to accentuate the deeper messages. Horror, for me, is indeed about fear, but it should be the medium, not the goal. I don't know if I'll ever be ready to share my horror writing. Letting people critique your horror particularly puzzles me. How do you deal with reviewers squashing your nightmares? It is hilarious to me that there are brave fears and silly fears, and yet, I have called people silly for being scared of slimy green monsters, spiders, and oh my god, cats. Haven't you? This year I'm experimenting a little with the blog, and writing about poems is something I want to try. This is not a poem I have spent months dwelling over, reciting and loving. It is a poem I stumbled across the other week, on Poem Hunter, during one of my usual guilty-pleasure John-Donne-reading-sessions. I'm thinking about you. What else can I say? & their tracks; birds, blue & elusive. First, allow me a moment to appreciate just how post-card-ly the writing is. Crisp, somewhat direct lines and abrupt pacing, the punctuation: look at all the &s, a fitting effect. The poem has this wistful tone I cannot get over. "What else can I say?" I am no expert, but this is how planned letters all sound, don't they? Especially those you write to people who know you the best. You sit down to write and don't know where to start, how to end, and feel a general loss for words that you fill up with routine descriptions till you get into the rhythm of it - and by the time you've finally dug deep enough into the meaning-well, the postcard ends. And short letters are like that, they don't seem to say much at all to anyone except who they're meant for. The poem leaves so much unsaid, so many blanks to fill. 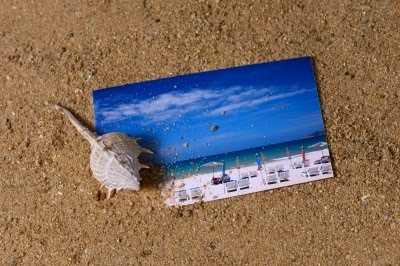 You know how a postcard hardly ever looks anything like the real place? The palm trees and the pink sand are a rosy delusion. The first lines of the poem remind me of something from, excuse the ill-timed reference, How I Met Your Mother, about how Lily insists on taking these fake "happy" pictures where their dazzling smiles conveniently hide all evidence of the disasters that led up to the photos. The poet is thinking of a lover she's distanced from, both physically and emotionally, and what comes to her in that moment is her rosiest happy post-card memory of him. She draws the comparison herself then and tries to wash it away, brings herself to face the fact that it's only a delusion, eventually gives up and talks about the humdrum of her routine. She's on vacation at a beach, in one of those 'poor-country' settings that had I been a little better at geography, I would have been able to name: the heat, the mosquitoes, the pocked roads, that local newspaper, a howling child and rooster and a hotel being built right beside - you get the picture. An extended vacation, it looks like, because she speaks of seasons and as a seasoned resident not a traveller, or maybe it's a permanent temporary-move till she's ready to go back, if ever. She calls the hotel someone's crumbling dream, then remembers her own crumbling wish. Her old relationship seems to her a flimsy facade, like the hotel, that she knows will run out of business as they do in those parts even as it is being built, a failure even if it is physically there. A part of her wonders, "a universe that includes you can't be all bad", what could matter as long as she gets to be with him. And she finds the answer right there in the postcard - one that she might be about to send him, there's the place for the address, but should she? When all she has of him is what she is about to send him - a botched slice of the truth. The postcard will reveal nothing of what she feels, just as her memory shows her only a skewed agreeable "glossy" image of him. She concludes with how it still hurts, time comes in waves and she floats on it, not moving ahead, not ready to go back to the past either. And love comes in waves too, she is caught up in them. This is the second time she mentions the rolling waves on her beach, in the middle of nowhere. And so the poem ends hauntingly with images of water, filling and pounding inside her, of drowning. It begs the question, is this her final note? This was fun for me, a mind-exercise I would love to repeat on the blog. I would also love to know what you make of the poem, your interpretation, if you see something I'm missing? Not to mention, poem recommendations would be very welcome. Happy reading! Write to me Emmi. Writing is like kissing, but without lips. Writing is kissing with the mind. The greatest comfort of the virtual world is the chance to spin yourself constant convenient fictions: an email acquaintance, a Twitter friend, a blogger crush. Emmi and Leo's emails perfectly capture the fun of every online relationship. In the beginning, they are cutely unselfconscious. The initial exchanges are teasing and flirty, both trying to outsmart the other while projecting a tailored image of themselves, not altogether disconnected from the truth, but still only a silhouette of their real self. Soon, piece by piece, Leo fashions out a fantasy-Emmi from her letters, while Emmi makes wild guesses about the kind of man Leo Leike is from the kind of words he writes. Their letters get increasingly charming and funny. An affair plays out only through email, completely eliminating the physical and yet, has this wonderful simmering sensuality. Even so, as their feelings grow, the casual becomes exhausting. They can't get enough of each other. It begins to take a toll on their lives. Long emails every couple of days turn into short one-liners every few hours, goodnight kisses and wake-up 'calls.' Each tries to fill up the blanks in his life with a seemingly perfect alternative. Emmi, married Emmi with her husband and her children, begins to act like an infatuated teenager even as Leo Leike conjures up in his penpal a beautiful woman of his dreams to reassemble his recently broken heart. Conversations for the sake of conversations start to spring up, and you wonder when it will appear, the fateful "when shall we meet?" But the story catches you by surprise. Emmi's escapism takes on a whole new level when she tries to set Leo up with her best friend. It is finally time to ask the question - what do they mean to each other? Where do they go from here? I don't have much to say about this book other than that I am fascinated by its somewhat easy profundity. The interesting thing was that I did not particularly identify with either Emmi or Leo, but I did imagine what I would say and do in their shoes and this revealed to me new uncharted sides to myself. The writer in me was wildly inspired by most of their exchanges. The ending was remarkable, I choose not to read the sequel. 1. The letters Emmi and Leo write each other which sound perfectly normal in German are a tad bit too formal in English. 2. The original title and appearance, as Caroline also mentions on her blog, are much more suitable for the content. The English title and cover seem too young-adult or chicklit, so much so that the book could not only disappoint the younger readers it attracts, but keep away a lot of people - like me - who may love it. The title gives the impression that it is a romance, which in the strictest sense, it is not - it is a book about... people. Simply that. 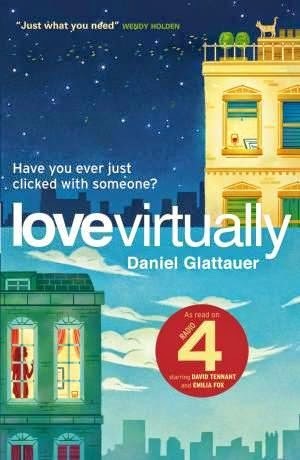 I'd recommend Love Virtually by Daniel Glattauer to anyone who has experienced inexplicable attachment to something fictional, someone virtual, and above all, to anyone who likes to write. In what we call "real life"- you're forever having to tailor your emotions to the circumstances, you go easy on the people you love, you slip into your hundred little daily roles, you juggle, you balance, you weigh things up so as not to jeopardize the entire structure, because you yourself have a stake in it. But with you, dear Leo, I'm not afraid to be spontaneous, or true to my inner self. I don't need to think about what I can tell you and what I can't. I just witter on blithely. It does me so much good!!! And that's all down to you, Leo. That's why you've become so essential to me: you take me just as I am. Sometimes you rein me in, sometimes you ignore things, sometimes you take things the wrong way. But your patience, the fact that you stick with me, shows me that I can be who I am. Someone out there likes the Emmi who makes no effort to be a good person, who plays up the weaknesses that would otherwise be suppressed. He's interested in Emmi as she really is; he likes her precisely because she's aware that there's so much of herself she cannot reveal to others, this bundle of moods, this harbour of self-doubt, this jumble of contradictions.